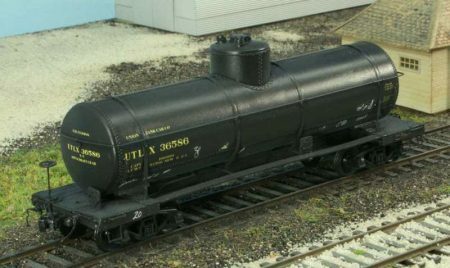 The UTLX Class X-3, 10,000-gallon tank car kit can be ordered directly from Resin Car Works. The model best reflects a prototype series of 10K-gallon capacity UTLX X-3 tank cars built in 1923. These kits are $60 each, plus shipping. Check out the details on the Kits page of our website. Scroll down a bit for the X-3 details and take advantage of the link to the page of Extras. Please use the PDF order forms to print, complete, and send in your orders. The Missouri Pacific Railroad installed 100 of these automobile cars in late 1941. These American Car & Foundry products were to become the first all-steel 50-foot box cars on the MoPac roster. These kits are $65 each, plus shipping, and are a limited run kit. When the current stock of decals are gone the model will be closed out. Check out the details on the Kits page of our website. Scroll down a bit for the MP car details and take advantage of the link to the page of Extras. Please use the PDF order forms to print, complete, and send in your orders. Thanks for your support of Resin Car Works and your patience while we restocked components for these kits. We have a few exciting models in the pipeline and will announce more here soon.